Adding lighting pieces to any room not only illuminates the space but adds great design dimension. This functional décor piece will help create a statement in your room and carry continuity of your design style. There are a few lighting types and understanding how each type functions will help you determine what will work best for you and your home. 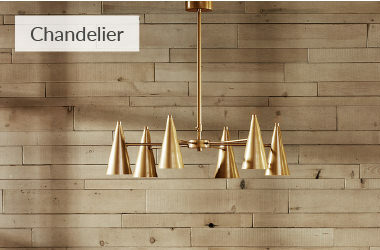 Whether you are looking for a practical piece to illuminate a room or you want an eye-catching chandelier to add sophistication and style- our large selection of lighting fixtures at Designer Living offers a little something for everyone. 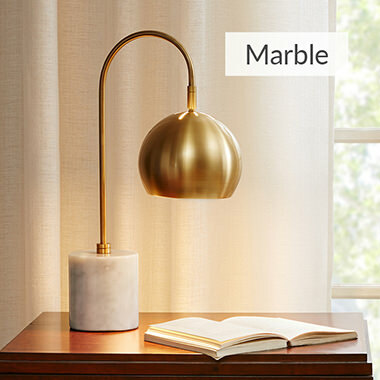 Table Lamp: The most versatile style of lighting, a tabletop lamp consists of a base and separate or connected coordinating shade. These lights will always be a plug in, making it easy to set up and move around. 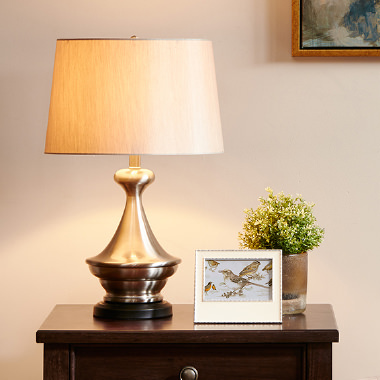 Table lamps come in various sizes so be sure to measure the surface you want to place it on to determine if it will be a good fit for your accent lighting. Floor Lamp: These lamps consist of a tall base, along with a separate or connected shade. 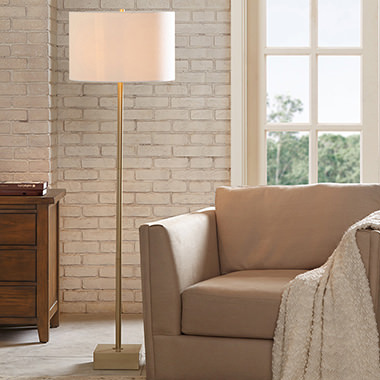 Floor lamps are great fixtures for corners or other places that a table wouldn’t easily fit in. Pieces like this will always have a wall plug, so they are also easy to set up. 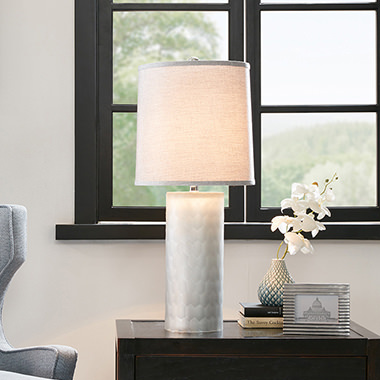 Some floor lamps have a bent arm, which usually is adjustable, however, always be aware of how far out a lighting fixture will come into your space. 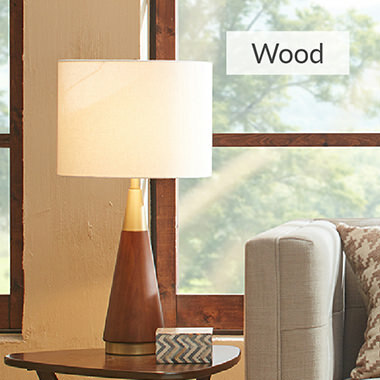 Floor lamps are ideal for the area behind the couch or alongside a loveseat. They can also be a modern accent piece for a bedroom or office. Hanging Lamps: Most commonly available are chandelier and pendant style pieces. Chandelier styles are more structured and have arms coming off a main rod. 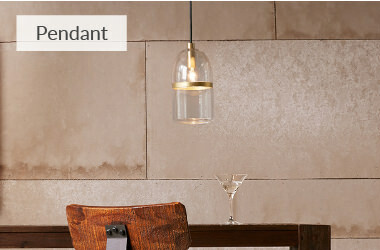 Pendant styles feature a lighting element on the end of a suspended cord or rod. Pendants can be grouped together to create a bigger statement or installed in a line. Some pieces have the ability to adjust the length of the rod or cord. Our hanging lamps and fixtures will always need to be hardwired into your ceiling, and require professional installation. Hanging lamps make a beautiful impact in any room. If you are looking to create a bold statement in a room, try incorporating a hanging lamp that fits with your current home decor style. 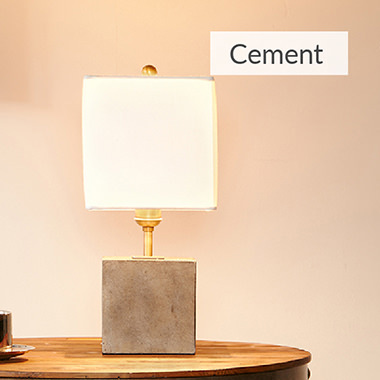 All three types of lamps come in a wide array of materials. 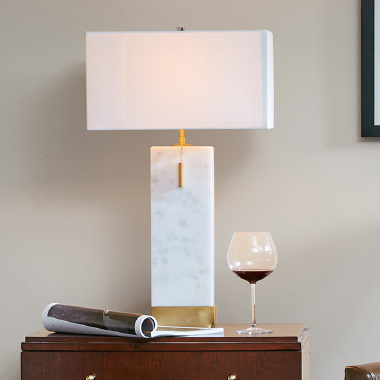 Table lamps provide the widest array of materials using metal, marble, ceramic, glass, wood, or cement. However, glass, ceramic, and metal are the most popular. 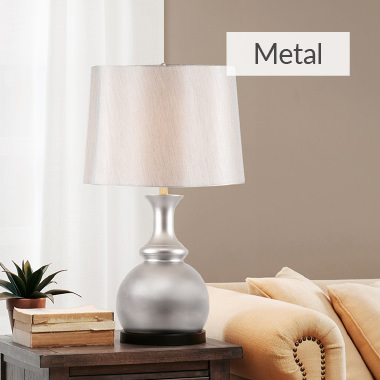 Floor lamps tend to be primarily metal, with some featuring glass or marble features. Hanging lamps and fixtures are typically made using metal, with some glass or ceramic elements. Traditional: Metal or ceramic bases with tapered drum or angled empire shades are classic elements to look for. These pieces are timeless and work easily in all rooms. 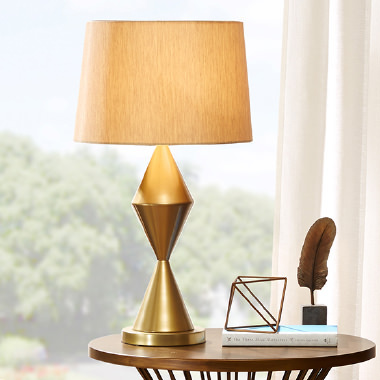 Mid-Century Modern: These lamps will have a slight retro feel to them. You’ll find gold hardware paired with natural elements like wood. Sleek lines and geometric shapes with drum or metal shades. 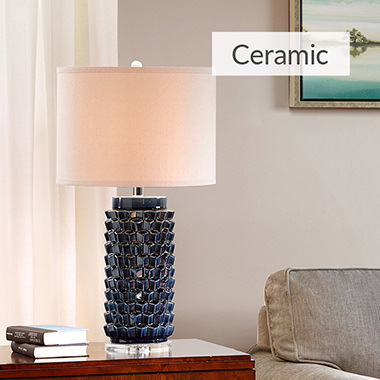 Casual: Whimsical, fun elements like colored glazes or patterns make these lamps perfect for any space. Ceramic pieces that have a tapered drum or angled empire shaped shade give these a softer, relaxed feel. 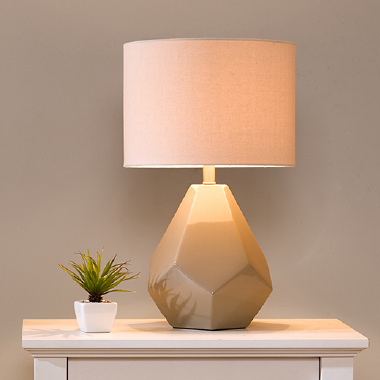 Luxury: Whimsical, fun elements like colored glazes or patterns make these lamps perfect for any space. Ceramic pieces that have a tapered drum or angled empire shaped shade give these a softer, relaxed feel. 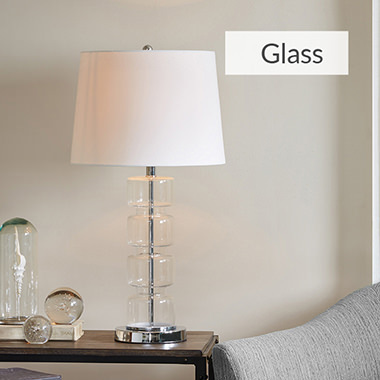 For table lamps, check the size of the surface you plan on placing the lamp. Be sure to account for the shade when picking your piece. If you plan on having other things on the table, a larger lamp might not be the best option. When considering a floor lamp, again take note of the base size of the lamp to determine if this will work in your space. Also, if it has a bent arm, be sure it won’t stick out into the space too far. Hanging lamps need to take into account a few aspects. Be sure the length will not be too low for your space, as not all can be adjusted. Consult with an electrician if you are not sure how the chandelier or pendant will function in your room.